Tesla has started accepting orders for its Solar Roof in California. Rollout of the glass roof tiles with embedded solar cells to other US states will take place over the next 12 months. My wife and I are considering a rooftop solar system. We were told by a SolarCity representative on May 17 that the Tesla Solar Roof will not be available on the East Coast until 2018. The company is making two styles of glass shingles — the flat glass and textured glass tiles — available first. The terra cotta and slate styles will not be available until next year, according to Tesla. There is no information available at present what the cost difference, if any, will be between the tiles available now and the tiles that will become available next year. At the present time, anyone can access the Tesla website, plug in their home address and some basic information about the size of their monthly electric bill, and get an instant quote on the cost of a Solar Roof. The folks at PowerScout went to the Tesla Solar Roof estimator and plugged in numbers for a typical single-family home in California with a 2,000 square foot roof and an average monthly utility bill of $150. Update/Note: As CleanTechnica reader “vensonata” notes, “The only proper comparison is glass tile roof with PV array on top, vs glass tile roof with PV embedded. And that, I feel, will give the advantage to the embedded PV. Why even mention asphalt shingles? 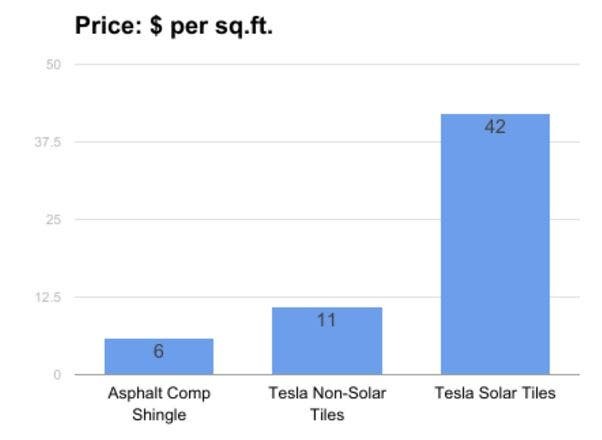 There is no comparable Tesla product to asphalt shingles, they don’t have anything that low class. Just as they don’t have an $18,000 electric car.” That’s an important note to keep in mind while reading the findings below. The calculator recommended that 40% of the roof be covered in glass tiles with embedded solar cells in order to produce enough electricity to offset the home’s normal energy usage. The balance of the roof would be covered with tiles that did not have solar cells embedded. It is impossible to tell the difference from the street, Elon Musk says. What if the homeowner decided to just add a rooftop solar system instead? PowerScout ran those numbers, too, and determined that it would take 19 solar panels with a capacity of 5.23 kW of electricity to offset a monthly bill of $150. With a typical rooftop system costing $3,250 per kilowatt, the traditional system pencils out at $17,000 minus a tax credit of $5,100. Net cost of the system would be $11,900 and the payback period would drop to about 6 years. Once again, there is no factor built in for financing costs or possible additions to property taxes. Not everything is about money, of course. There are intangible benefits to the Solar Roof that are hard to put a price on. For one, most people would presumably say that it looks better from the street than a conventional rooftop system. For another, it comes with a 30-year warranty, but the company representative I spoke to suggested that there is really no upper limit on how long the glass tiles will last. Even if they stop producing electricity, they will still continue to function as a roof that protects the home from the elements for a long, long time. PowerScout estimates the cost of a new 2,000 square foot asphalt shingle roof to be $12,000. Asphalt shingles have a 20-year warranty. If a new roof is needed before the solar panels can be installed, the total cost increases to $23,900 and the payback period becomes 13 years. If a new roof is not required, the traditional rooftop solar system is 68% cheaper than the Solar Roof. If a new roof is required, the total cost of the roof and solar panels will be 35% less than the Solar Roof.